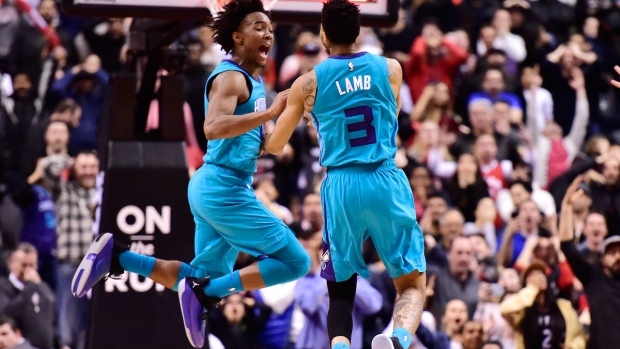 TORONTO -- Jeremy Lamb launched a buzzer-beater from 48 feet to lift the Charlotte Hornets to a 115-114 win over a stunned Toronto Raptors team on Sunday. Kawhi Leonard had 28 points to top Toronto (51-23), who were playing just their third game of the season with a full complement of healthy players. Pascal Siakam added 23 points, while Marc Gasol had 17 for the Raptors, Fred VanVleet added 12, and Serge Ibaka chipped in with 10. The game featured a Hornets team hoping to claw their way up into a playoff position, versus a Raptors squad hoping to build some momentum and chemistry among a roster that's looked like a revolving door with injuries, trades, and Leonard's load management. The Hornets arrived on the heels of a big win in Boston a day earlier, in which they fought back from an 18-point fourth-quarter deficit. The Raptors sliced Charlotte's lead to seven points on a big block by Powell that led to a VanVleet three, and finally brought the disgruntled Scotiabank Arena crowd to its feet. Back-to-back dunks by Siakam and Leonard highlighted a 12-0 Toronto run that made it a one-point game with 4:12 to play. Leonard gave Toronto a two-point lead with 45 seconds to play, then had a big block at the other end. Charlotte had possession with four seconds left, Siakam stabbed the ball away from Lamb, who launched up his long shot at the buzzer leaving the crowd stunned. Lowry returned after missing four of five games with ankle injuries. Raptors coach Nick Nurse said pre-game that "it's exciting" to finally have his roster at full health. "We're gonna see something probably a little bit different, obviously, with some healthy bodies in there," Nurse said. "It'll be interesting to see the lineups that hit the floor tonight."